I had boudoir photos taken for my boyfriends birthday and I was going to order a photo book until I came across this. I could not be more pleased with how this turned out!! The leather is very soft ! 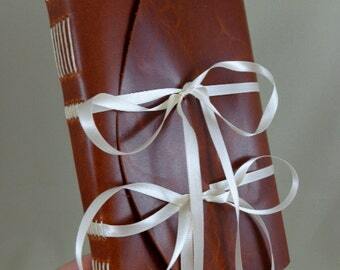 I love the look of the black leather & ribbon. It showed up a whole week before I needed it. Fast shipping !! Can’t wait to give it to my fiancé on our wedding day. Launching something new that I'm very excited about! This is my design for a 2018 Year Journal, with room for a page each day plus a little more. I hand painted the leather with Waterproof india ink. I hope you all love it! Who do you know that needs one? Made good use of my small watercolor sketchbook design yesterday while painting En Plein Aire in the Chihuly in the Forest exhibit at Crystal Bridges Museum of American Art. It works great, even without an easel! The Artist Studio is the umbrella that encompasses all of my creative endeavors. My main focus for the last few years has been handmade books. This medium is perfect for me, because it can be a combination of so many different artistic disciplines, but at it's core is the constant challenge of functionality. I love a challenge, and I love to create. Book binder, Painter, Graphic Designer, Illustrator, Photographer. Jennifer was raised in the Ozarks region of Southwest Missouri, where she learned a love for nature, history, and craftsmanship. She started The Artist Studio in 2004.